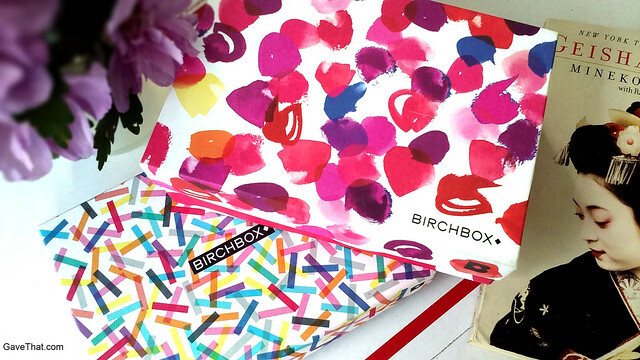 Birchbox's all time best sellers include Milk Makeup's Ubame mascara, amika Perk Up Dry Shampoo, Supergoop! Shine On Lip Screen SPF 50, Dr. Jark+ Premium Beauty Balm SPF 45+ and a Vasanti BrightenUp! Enzymatic Face Rejuvenator. After using these it quickly became obvious why they are Birchbox's top sellers. 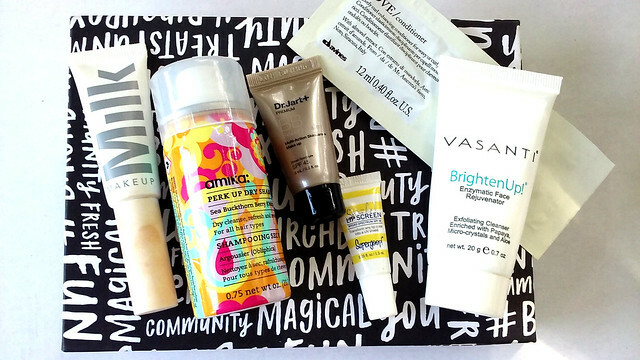 Birchbox should consider offering a curated box such as this at all times. That would likely defeat the purpose of these boxes (to surprise and get people to try new brands) but it was refreshing to try products that far exceeded expectations. The star, if one could be chosen, had to be the Vasanti BrightenUp! Enzymatic Face Rejuvenator (which actually sounds slightly Steam Punk). It's magic! Really this was a pleasant surprise. Slathering it on it feels sandpaper gritty from the conundrum crystals typically found in microdermabrasion treatments. This was slightly off putting at first as those with acneic and finicky skin can attest, microdermabrasion is not always a skin refiner. 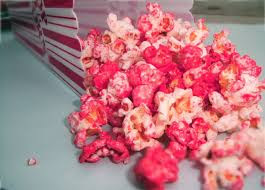 The resulting inflammation is just not worth it. Vasanti's BrightenUp! on the other hand suspends its crystals in a creamy base which makes this scrub way gentler than a professional treatment. Still the results were immediately apparent. This gave some of the softest, smoothest skin ever with zero inflammation or redness. In order for the papaya fruit enzymes to kick in this really needs to be left on the skin a minute or 2 prior to exfoliating so try it as a mask or sing the ABC's. The next surprise in the, wow this is awesome department, was Milk Makeup's Ubame mascara. Squeeze tube mascara's have always been intriguing because it seemed as if they would have less of a chance of drying out so quickly. That remains to be seen with this one by Milk but this is worth trying for the brush alone. This promised major curl and it actually delivered. It fattened this up without going spidery and best of all it did not flake nor run in the rain. It's similar to Too Face's cult classic but the brush with its 3 balls on Ubame gives a curl on par with using one of those lash curler contraptions. The third crowning star is the Supergoop! Shine On Lip Screen SPF 50. Non-greasy unlike many others currently out on the market, contains some sort of mintiness for a bit of lip plumping and it actually stays put. It actually works over lipstick too. The last two were actually on a test them out (or purchase) list for some time now. In particular the Dr. Jark+ BB cream. Is there a special way to make this work? What comes out of the tube and smooths onto the skin decidedly gray in tone. Probably from the zinc. After a few wears and too many, ...are you feeling alright?, inquires this one sadly ended up in the no go pile. Missha remains a favorite with better shade choices. Last from the best seller collection was amika Perk Up Dry Shampoo which many purchase for the scent alone. A sea buckthorn berry which is reminiscent of a slightly musky fig newton or a Quaker breakfast flats. It seemed the same as Psssst! and most other drugstore dry shampoos without being overly drying or crunchy. 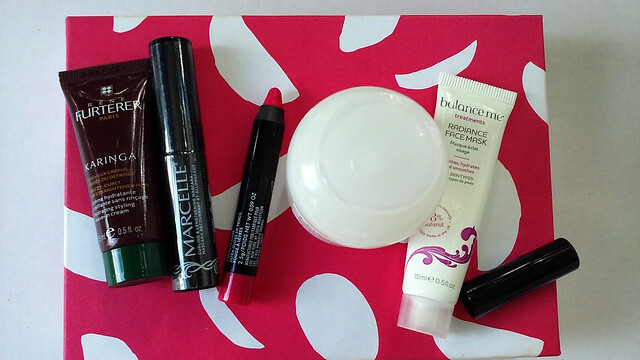 This Birchbox contained a balance me Radiance Face Mask, a LOC Ultra Gloss Lip Pencil in Punch Line, a Marcelle Xtension Plus Curl mascara and hair care by Rene Furterer Paris and Davines. The two stars of this box were definitely balance me's Radiance Face Mask and LOC's lip gloss pencil in the summery shade of hot pink watermelon punch. A full size tube of balance me's mask, along with Vasanti's, is on my re-order list while the gloss will likely last me eons thanks to how pigmented it turned out to be. If you liked the Revlon (or every other lines clone) balm stains, this is on the same level. The mask by balance me on the other hand has a creamy, moisturizing clay texture that never quite dries and fruit acids that really do brighten. Some grit, from walnut shells further exfoliates when you're removing it with a warm wash clothe. While walnut shells are not my favorite, these were sparsely sprinkled in so the exfoliation seemed gentle enough. This has turned out perfect for these muggy days filled with bike riding or the beach (aka too much sun).